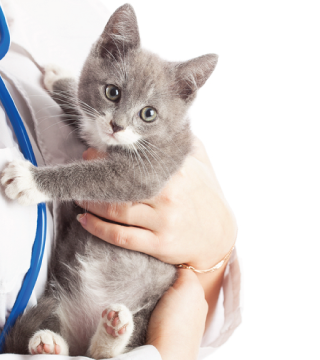 If one of the veterinarians at Carson Veterinary Clinic discovers that your cat has a short term illness, or an ongoing chronic health issue, your kitty may need prescription medication and it will be your job to give it to them. Giving medication to a cat can be challenging when he doesn’t want to cooperate. At Carson Veterinary Clinic, we are here to explain how you can give your cat his medication successfully, without stressing out your feline friend or yourself. If you are a visual person and want to see for yourself how to administer cat medication, here is a very useful YouTube video demonstrating how to give your cat liquid medicine. A picture is worth a thousand words, and videos are golden when it comes to this kind of stuff. If you have to medicate your cat for a long period of time, have a game plan. You will want to be prepared with a plan of action. While every cat is different when it comes to taking medications, most cats respond well to positive reinforcement when administering cat medications. You will have a quick window of opportunity to medicate your cat, before he changes his mind. Trying to medicate your cat on the ground is much more difficult and tough on both of you. Place the cat comfortably on a high table. Here are some great photos, step by step on giving your cat medications. If you think you may be noticing a change in your cat’s behavior, please call our office at Carson Veterinary Clinic and make an appointment. Even the smallest changes in behavior can indicate that your cat is facing a significant health problem and may need medication. If your cat is already on prescription medication, we would be happy to supply you with refills Talk to one of our veterinarians about prescription cat medication at your next appointment.